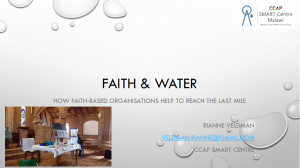 The CCAP Synod of Livingstonia Development Department (SOLDEV) through the CCAP SMART Centre is offering the position of Centre Manager at the CCAP SMART Centre. Interested candidates are invited to apply for the position. The position will be available from May 1st, 2019 onwards. We are looking for a candidate who is passionate about improving access to Water and Sanitation and who will be able to take over the Centre Manager position. As Centre Manager you are in charge of managing the team, to give direction in terms of long-term vision and planning and to ensure the future growth of the activities. Closing date is Momday 8th, 2019. 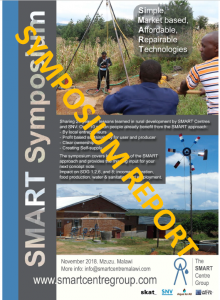 The presentations from the SMART Symposium, held in Mzuzu from 13 – 16 November 2018, are now available online. 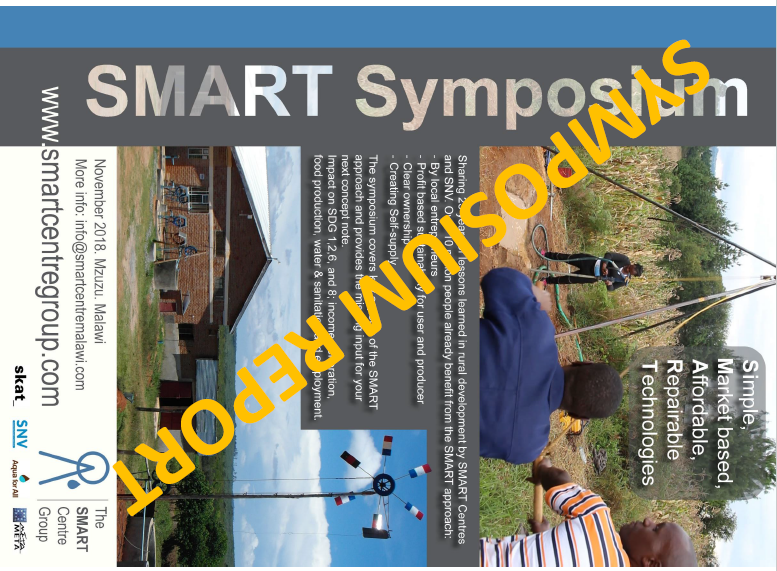 The presentations can be downloaded through the following link SMART Symposium Presentations. 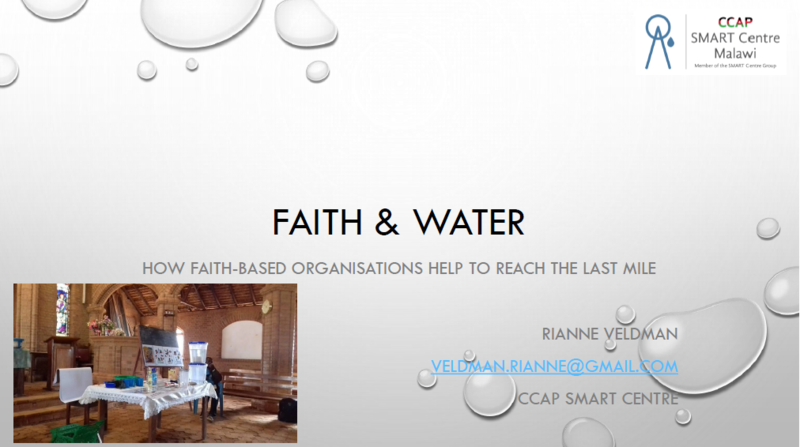 The CCAP SMART Centre has been awarded a project with Wilde Ganzen. 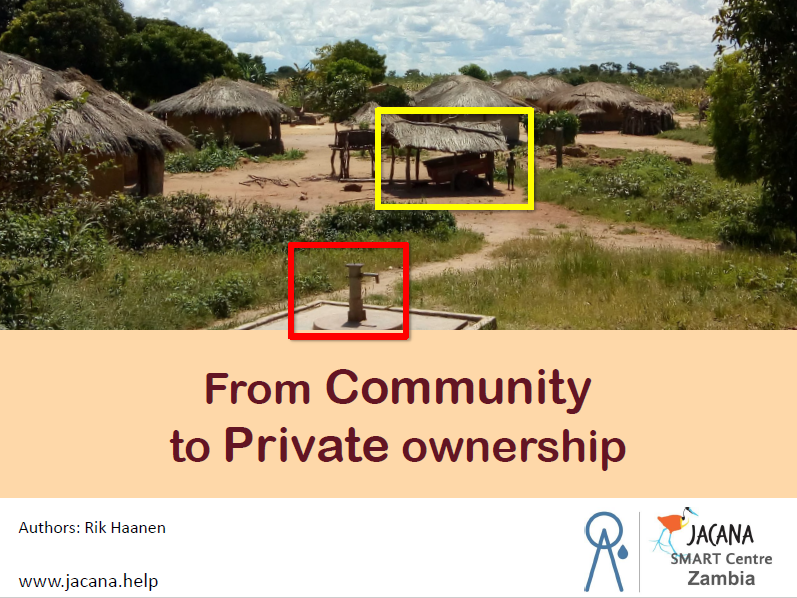 As part of the project 20 new wells will be constructed by the trained companies and fitted with a hand pump. The funds for the project have been raised through ‘Wandelen voor Water‘ by Rotary Club Apeldoorn ‘t Loo and will be topped up by Wilde Ganzen. As part of the fundraising a short clip was broadcasted on the National Television recently. We have recently added a page on our website with manuals, recent papers & reports as well as our past newsletters. 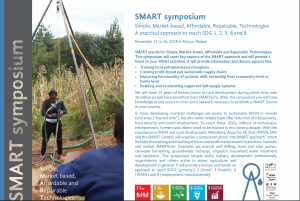 The page can be accessed through http://www.smartcentremalawi.com/index.php/resources/. 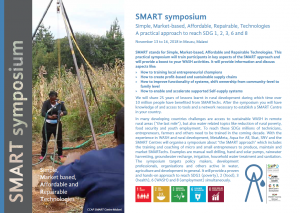 The SMART Centres are organising a SMART Symposium from 13 – 16 November 2018. 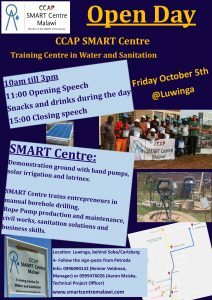 On October 4 and October 5 the CCAP SMART Centre organised two Open Days. The first was for the SMART Centre members and their families and the second for the general public. Both days attracted good interest and led to business opportunities for both the entrepreneurs as well as possible partnerships for the SMART Centre. 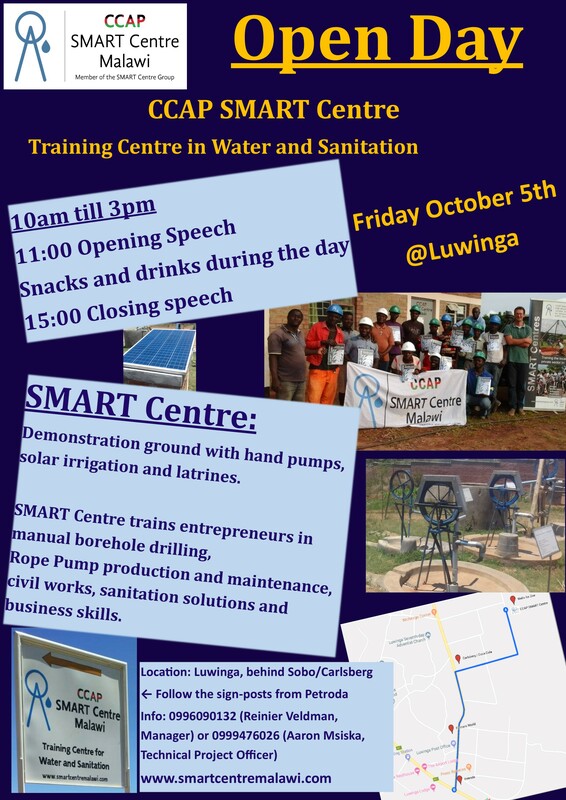 The CCAP SMART Centre is opening its offices, workshop and Demonstration ground during the Open Day on Friday October 5th, 2018. Between 10AM and 3PM the public is welcome to visit the SMART Centre and appreciate the demonstration ground. In November 2018, MetaMeta, Aqua for All, SNV and the SMART Centres will organise the SMART Symposium to share lessons learnt in WASH and rural development from the past 25 years. In this period over 10 million people have benefited from SMARTechs. 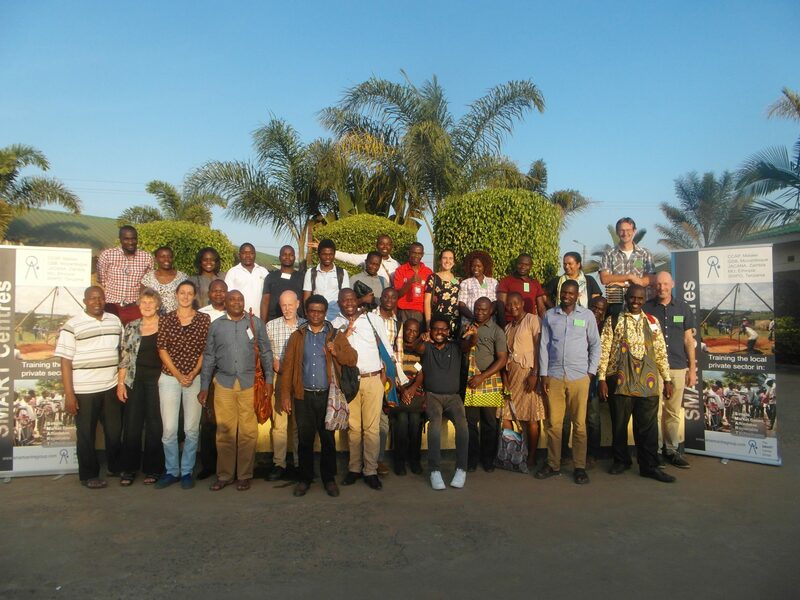 The symposium will take place in Mzuzu, Malawi from Tuesday 13th to Thursday 15th of November, 2018. There is an optional fourth day on the 16th of November with additional field trips, allowing participants to engage in in-depth discussions with trained and mentored businesses. For registration or more information contact us through info@smartcentremalawi.com. 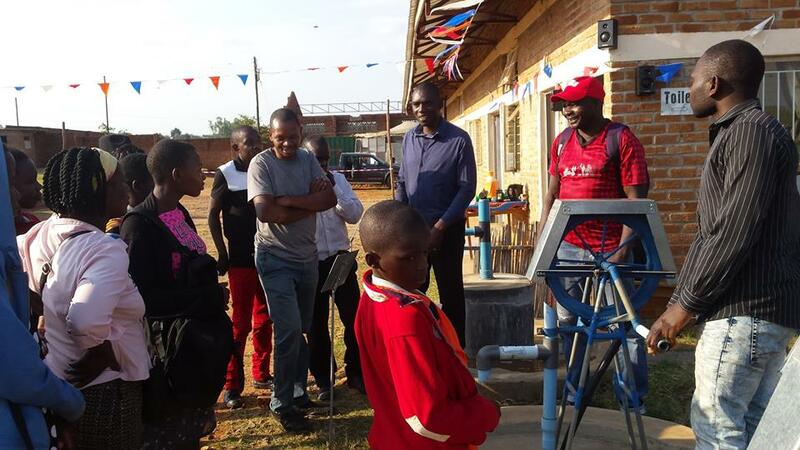 “The installation and maintenance of Afridev pump training took 3 days. The mode of training was good. We received both theory and practical lessons through experienced trainers; Aaron Msiska and Kayipa Banda. Both were well prepared for the training. We managed to visit three sites where maintenance was carried out, namely SMART Centre demonstration ground, Lusangazi village and Geisha primary school. 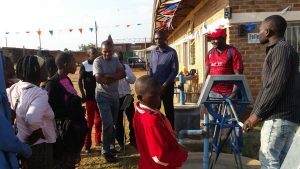 Within three days of training, nearly every trainee was familiar with components and functionality of Afridev parts, dismantling and reassembling a pump as well as identifying a problem at a water point before dismantling. Participants were enthusiastic to start maintaining Afridev pumps and promised to work hard in their localities. For instances, 4 participants who attended the training have been picked to work in rehabilitation of 5 Afridev Borehole in Karonga district. The project will help them to expand their knowledge on the same.